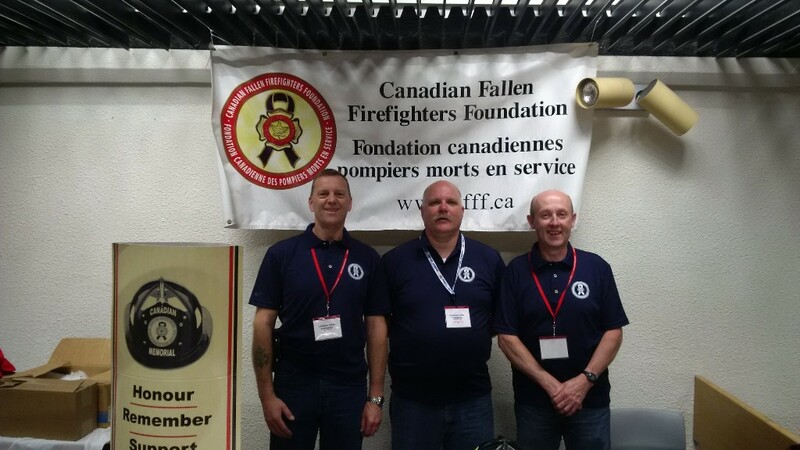 The CFFF attended the annual Fire Department Information Conference (FDIC) Atlantic in Wolfville, Nova Scotia on the weekend of the 7 June 2014. The booth was manned by firefighters and long-time supporters from the Halifax Fire Department namely Dave Clement, Norman Lavoie and Myles Faulkner. Between raffles and the sales of CFFF items they were able to raise $2400.00 in only one day of operation! Thanks to all the supporters and the firefighters from Atlantic Canada that stopped by. The gang at the CFFF booth at the FDIC in Wolfville NS. In the picture from left to right, Dave Clement, Norman Lavoie and Myles Faulkner. Copyright © 2019 Canadian Fallen Firefighters Foundation. All Rights Reserved. Site Designed and Built in 2015 by Impello Inc.